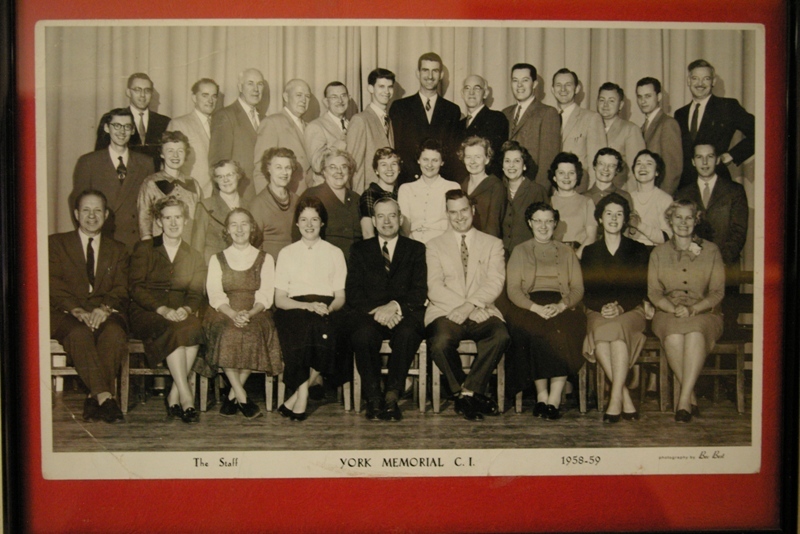 Dave Devall, CTV meteorologist and a York Memorial Alumnus started his career in 1956 with his first job in broadcasting as an audio operator. Who would have guessed that fifty-two years later I would be joining him while he recollected his years at York Memorial. 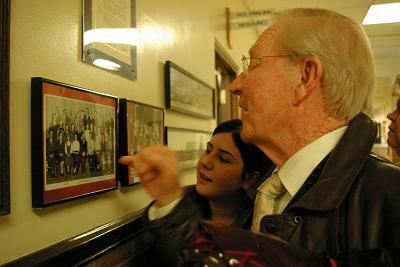 Graduating in the year 1951, Dave Devall was never a kid who enjoyed learning. He admits to being a procrastinator, and recalls his academic experience at York Memorial as being “okay.” Playing as a half back on the school’s football team, Dave Devall remembers a few other activities in which he participated, including the boy’s hockey team, Student Council and numerous clubs at school, but claims that his years could have been better if he was a bit more involved. Nevertheless, every time Dave Devall represented Memo, he felt a sense of pride wearing gold and red and being called a Mustang, a term born while Dave Devall attended York Memorial and still used today. Despite his “okay” memories of high school, his eyes shine when he remembers Ms. Bennet, his English teacher who became an inspiration to him as the first teacher to introduce him to public speaking. A requirement of senior English class was oral composition, and while most students would rather do anything but make a speech, Dave discovered he loved to stand up and talk to people. He earned top marks in the school and went on to compete in regional and provincial competitions successfully. His trophy now proudly sits beside one of his father’s on their home mantle, and Dave’s career of “standing up and talking to people” is legendary. Dave Devall grew up in the York Township Area, now currently known as the York South Weston Riding. His family was not rich, but they were not poor either. He had a part-time job at Loblaws and unbelievably earned the highest pay as a part time student making $1.65 at the time! Dave Devall began his career in the Royal Canadian Air Force from York Memorial. He remembers clearly the day when a Flying Officer came and spoke to all the students on Career Day. With a total cost of $33,000 to train a pilot at the time (now approximately $1.5 million), Dave Devall joined the reserve. He became part of the 400, 411 and 2400 Squadrons in Downsview and got his Air Force papers there. Today Dave Devall still holds his pilot’s license and just recently was named Honorary Colonel with 436 Transport Squadron in Trenton, a huge honour of which he is justifiably proud. Occasionally he can be seen forecasting the weather in full air force uniform when he has been working during the day. As I sit beside Mr. Devall and listen to his past, I see his eyes light up and twinkle as he recalls his memories in the Air Force. These, he believes, were his finest moments where he was taught morals, rules, and most important, discipline. If you have ever watched the news when Dave Devall broadcasts, then you are probably familiar with his special skill of being able to write backwards with both hands. This was another thing that the Air Force taught him. Early in his career, he was the fellow responsible for transferring information as it arrived to the duty controller, so he had the job of writing the status of the various squadrons in another room. 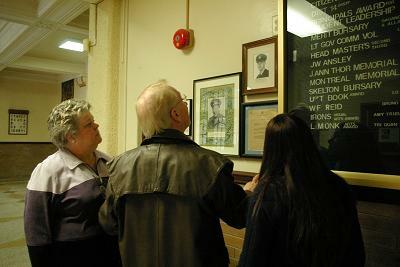 The transfer consisted of writing all the information on the glass wall that separated the two- so the gentleman doing the writing had to do it backwards so the officers could read it. While in the Royal Canadian Air Force, Dave Devall also juggled his education at Ryerson University. He enjoyed every aspect of broadcasting and this is why he enrolled in the Radio and Television Course. While studying at Ryerson, Dave Devall started looking for a part-time job. 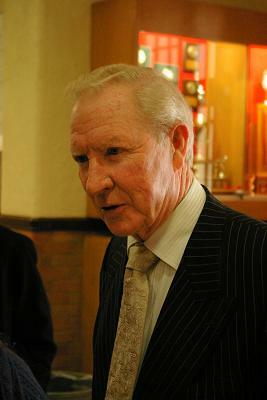 It was Kent Thompson who offered him his first job in television and sent him to Peterborough where he auditioned. With his unique talents, and his good looking charm, (thanks to a couple of years of modeling), Dave Devall got a job and started that same Monday. Everything seemed to be going great. He landed his dream job, was able to balance work and school into a manageable schedule and was still able to D.J. the dances at Casa Loma every Saturday night. While working in Peterborough, Dave Devall managed a schedule where he could study and write his exams at school. Traveling back and forth from school to work seemed like a good plan, but Ryerson did not approve, indicating it would set a bad example to other students. They asked him to quit his job and it was then that Dave Devall realized that broadcasting was his passion. He packed his belongings from Ryerson, and with only a couple months before he would finish the semester and graduate, he quit school. This was his biggest disappointment; not being able to finish an important thing he had set out to do. When he auditioned for CTV, over 2,000 other people were auditioning for the same position. Dave Devall was not aware of this and with the security of having his job in Peterborough and not knowing how much competition he had, made it easier. In 1961 Dave Devall was asked to join CTV as a broadcaster. The rest is history. Coming close to retirement, Dave Devall would like to slowly phase out of the business, but it is not going to be easy with his great love for broadcasting, and a strong relationship with all the six o’clock team. Dave Devall would like to start enjoying the fruits of his labour. He does not exactly know what he would like to do when he is retired, but small tasks such as gardening, planting, even building a workbench are things he looks forward to, and motivational speaking is in the planning stages. He believes the active and interesting mind must be exercised and tested, so he is not completely ready for retirement anytime soon. Concluding the interview, I asked Dave Devall what advice he gives to students who would like to enter the industry. He encourages students to keep an open mind and pursue many dreams, since “life has a way of taking you along the path that it wants you to go, not necessarily the path you want to follow.” Thanks Dave, and all the best.